Libyan PM Fayez al-Sarraj: Can Former Architect Rebuild a Shattered Country? Hero? Traitor? Mercenary? Reformer? It is hard to categorize General Khalifa Belqacem Haftar, an iconic figure emerging from Libya’s persistent chaos. The man has already had many lives and survived death countless times. Like a chameleon, he has switched sides repeatedly. He is the country’s phoenix, always emerging from defeat, although he has had little subsequent success. Nevertheless, the rogue general, now in his seventies, keeps trying. Haftar belongs to Muammar Gaddafi’s generation. Born in eastern Libya in the 1940s, he belongs to the Ferjani tribe. He studied at the Royal Military Academy of Benghazi, where he met Gaddafi. He received further training in Nasserite Egypt and the Soviet Union, which influenced his early years. He joined Gaddafi during his 1969 putsch and became one of the Free Officers who established the Jamahiriya. He fought in the 1973 Arab-Israeli War and reached the rank of colonel in the 1980s, when he participated in Libya’s invasion of Chad. He was defeated in 1987 and captured with hundreds of his troops by Chadian forces who sneaked into Libyan territory (the episode belongs to the “Toyota War”). For reasons still unclear, Gaddafi abandoned him and his men, refusing to negotiate with Chad. Haftar was approached by the CIA in his prison cell and was not hard to convince: the socialist, pan-Arabist revolutionary became a CIA operative. A year later, he was funded by the US government, establishing an army in N’Djamena whose aim was to topple Gaddafi. This was the beginning of the Libyan National Army (LNA) that he claims to lead today in Libya. The LNA was meant to become the military wing of the National Front for the Salvation of Libya (NFSL), an opposition group led by Mohammed Magariaf, which later became the National Front Party. In 1990, however, a coup in Chad brought to power Idriss Deby, Gaddafi’s ally. Haftar and his men had to be evacuated by the Americans, first to Nigeria, then to Zaire (now the Democratic Republic of Congo), then to Kenya, and finally to the United States. They became refugees and were scattered across the country. The defeated colonel, who received American citizenship, settled in Virginia, in a town populated largely by CIA employees. He was allowed to run a training camp for his LNA. In 1994, Haftar resigned from the NFSL and created the Libyan Change and Reform Movement. It was unsuccessful, but Haftar continued to plan coups in Libya and attempts against Gaddafi’s life up to 1996, before vanishing from the public scene. When the 2011 revolution and civil war began in Libya, Haftar re-emerged and decided to join the rebels. He entered Libya from Egypt in March 2011. He sought to become the rebels’ military chief but was instead appointed head of the ground forces by the National Transitional Council (NTC) and given the rank of lieutenant general in compensation. His nemesis was Major General Abdulfattah Younes, his military superior. Some accuse Haftar of having been involved in the latter’s assassination in Benghazi, in July 2011, but Haftar himself survived an assassination attempt the same month, blamed on Gaddafi. His brief appointment as chief of staff in December 2011 was fiercely opposed by the NTC and number of officers, so he had to retire, withdrawing to his house in Benghazi. Haftar was never fully trusted by the anti-Gaddafi politicians, who feared the “dictator” inside him and suspected that he was a US agent. By early 2012, he seemed completely isolated. There was a second attempt on his life in July, and he gradually disappeared from the radar. A year later, he published a roadmap for Libya, but no one took him seriously. Many failed to realize that Haftar amassed a large base of support among former members of the Libyan army who had fought against Gadafi in 2011 and who felt threatened as the Islamists began to “purify” the state of elements of the “old regime.” He was also capable of winning the Zintan tribe (western Libya’s strongmen) to his anti-Islamist cause, as well as a number of businessmen. 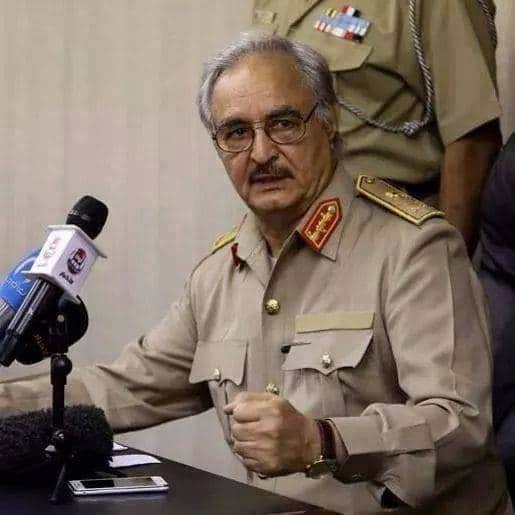 Haftar portrayed himself as Libya’s saviour (“Libya’s Sisi”) from Islamist organizations spreading chaos. This allowed him to make a comeback in early 2014. In February, he staged his “television coup” by filming a video in which he laid out a roadmap and announced his takeover of the institutions of the Libyan state. As in 2013, no one took him seriously, and the coup did not materialize immediately. In May, however, his forces conducted airstrikes on Benghazi and attacked Tripoli. It was the beginning of Libya’s second civil war. A year later, the country is divided, Benghazi is half destroyed, and oil-shipping terminals are burning. Extremist Islamic State is strengthening its presence. Two governments are competing for overall power: an Islamist leaning government in Tripoli and the elected, internationally recognized one in Tobruk. Haftar is fighting for ‘Tobruk’. In March 2015, the Tobruk government promoted him to lieutenant-general and supreme commander. The Tripoli government for its part branded him a war criminal and underlined his appointment will only complicate international efforts to pacify the country.